This article is an attempt to journal my experiments with adding thermal mass on and around my small woodstove in my 2-story, 2-car garage. This is my shop. This is where I play, build, tinker and wrench on things. It needs to be warm enough to be comfortable working when it’s below zero outside but not so warm that my beer needs a coozie. This is the continuation of a post I started on a hidden page of my business site (rileydesigns.com). The post started to get some attention so I’m resurrecting it and opening things up for discussion. 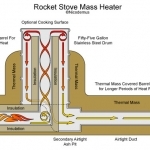 Can you get better performance out of a woodstove by adding thermal mass? What else can you do to milk as much heat as possible out of your woodstove? How will that effect the draft? Too much mass on the sides, not enough up above. Lower bricks aren’t hardly getting warm and outer side bricks are much cooler than the inner ones. I want hot bricks exposed to open air. Much better though still too much mass in some places. I’m going for all bricks HOT after 6 hours of firing the stove. This one could be the one! All the bricks are very hot after burning the stove about 6 hours. I may even add an additional brick or two against some of the surfaces that are too hot to touch. Next step is to bring the ducting right up next to the wood stove and possibly even attach the duct to a cavity in the themal mass around the stove or attach it to a heat reclaimer like the magic heater. This will require an additional 30 feet of 6″ ducting which I will most likely need to insulate in order to make sure that it’s able to deliver that warmth all the way to the green house. Well, I just couldn’t call it done. At the onset of this project’s second winter, I located a Magic Heater at a Re-Store in the area ($50 – totally scored!). This turned out to be exactly what I needed! On very cold mornings/days in the shop, I can never get enough heat fast enough from a cold start because the thermal mass definitely slows down the initial heat delivery. Now, between the woodstove’s built-in fan on the back of the stove and the in-line magic heater, I’m able to get a good amount of warm air blowing in my general direction fast. The only downside to this… decreased draft in a chimney that was already slightly challenged. Sucking all the heat off the chimney slows the draft down noticeably but it’s still completely worth it. I have no problems when the stove is cranking. I just have to be strategic when loading the fire and any time I need to open the stove door or I’ll get some smoke in the shop. Not a big deal, but still bothered me enough to explore another option ( Tjernlund Draft Inducer ). More on that below. Bothered by my stoves poor draft performance (smoke coming out door when loading), so I installed a draft inducer (shown below) near the top of the flue/chimney inside the shop, on the second floor. Then, I connected the power for the draft inducer to a remote controlled outlet so that I can just click it on with a remote any time I’m starting a fresh fire or loading the stove. It works great and is an easy way to jump-start a fire. This more than compensates for the decreased draft caused by the rapid extraction of heat from my Magic Heater and tall exposed single wall pipe. Troubleshooting Rocket Stove Issues – Smokeback How Much Will it Cost Me to Have Free Heat?